Easy going down, tougher coming up! The best part is the laughter, gosh, I have such a good time with my snow angels! Special thanks to my spouse for handling the dog and the camera! 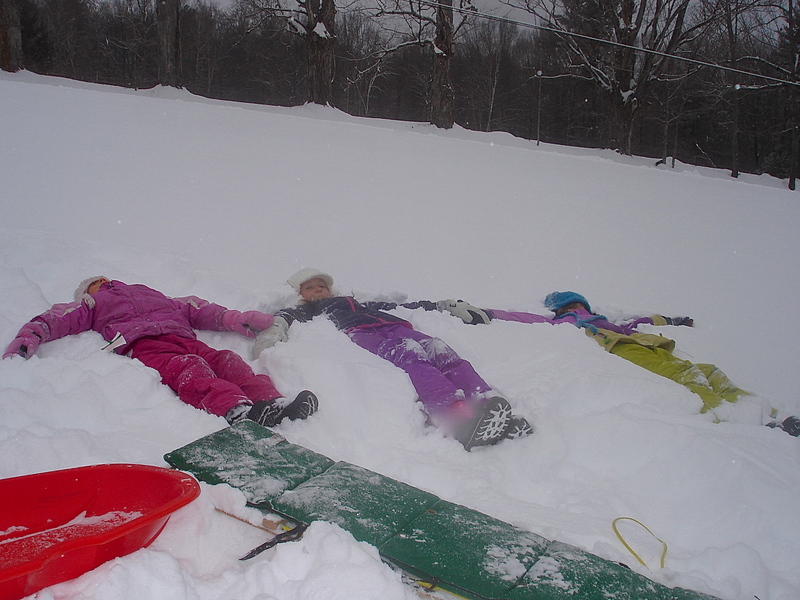 This entry was posted in Country Living and tagged kids, laughter, sledding, snow, snow angels, tobogganing, winter, winter activity. Bookmark the permalink. Thanks, Kate. Nothing like a good lay down on a bed of snow! Looks like fun! 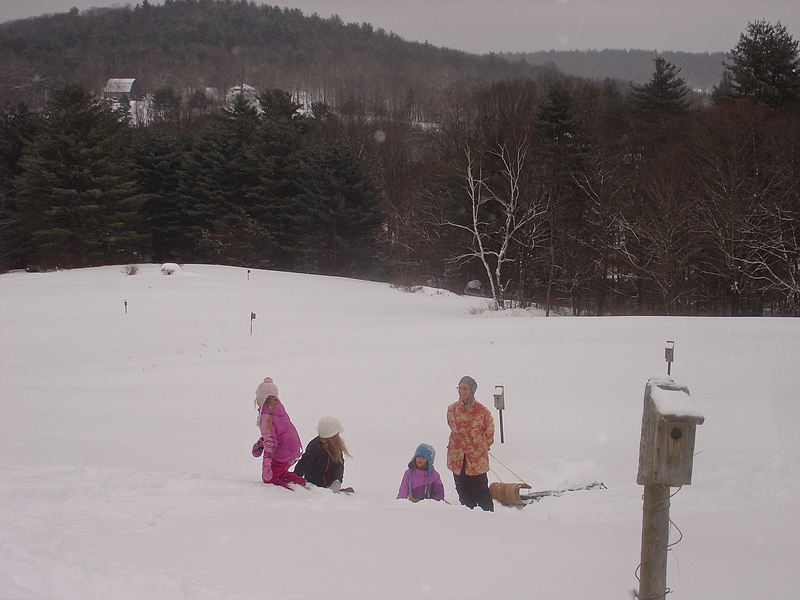 When I was in college in N.C. we went sledding using the trays from the cafeteria. They worked alright , except that sometimes instead of going straight, we would end up spinning. Spinning is why I never liked snow tubes – one ends up going backwards downhill and you can’t see what’s coming – so dangerous! Luckily, this was ‘slow snow’ – I’m past the age for fast rides on crusty snow! Oh, what fun! It brings back memories of going up on the hill behind the house and sledding onto the frozen pond. I got back on skates this winter after nearly 50 years, so perhaps next year I will go sliding down the hill with you! Kids make life such fun! Yes, they do! You have such a beautiful and open heart to let them on your hill and bring such joy into their lives! When I was a kid, the one neighbor who had the hill, was not as gentle as you — What JOY you bring into the lives of others! 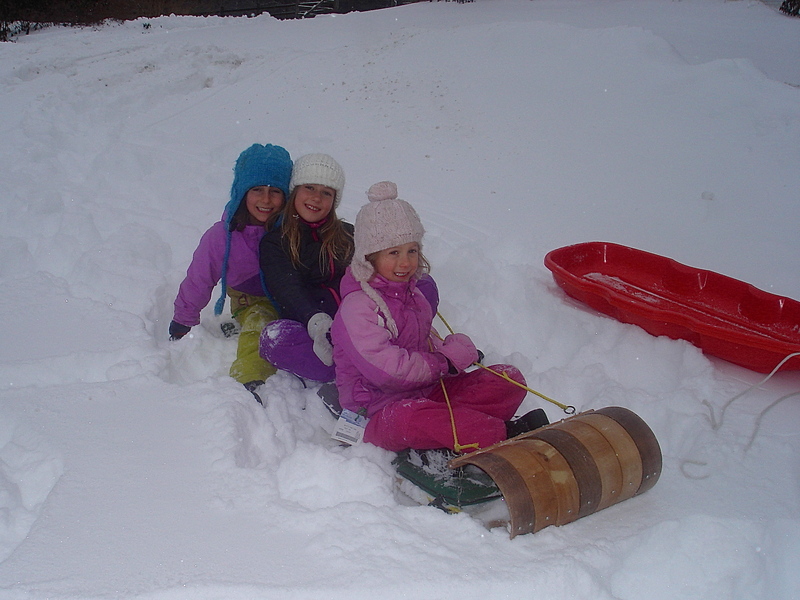 Happy Sledding, Eliza! We have great neighbors all around us who allow the use of their land for recreation and even encourage it. It is a beautiful thing! Wouldn’t that be wonderful? You’d be most welcome! What wonderful pictures! The kids and you all look like you’re having great fun. What I like most (photographically) is that all the white really focuses the attention on the people and their colorfulness. The nearest I’ve come to this was as a kid in San Diego — my sisters and I rode down a hill of dry long grass while sitting in cardboard boxes. It was great fun! Thanks, M. It was a great time – I laughed a lot. Good for the soul. Snow outfits today are very colorful, photos come fully saturated! 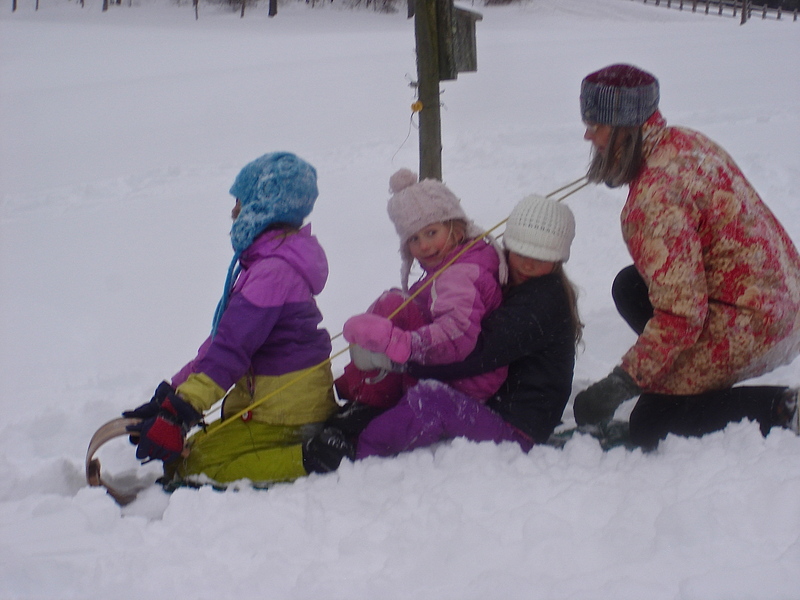 Every kid should experience sledding in some form – it is such a thrill, not to mention super exercise, which folks (in my opinion) today don’t get enough of! Thanks, Val. 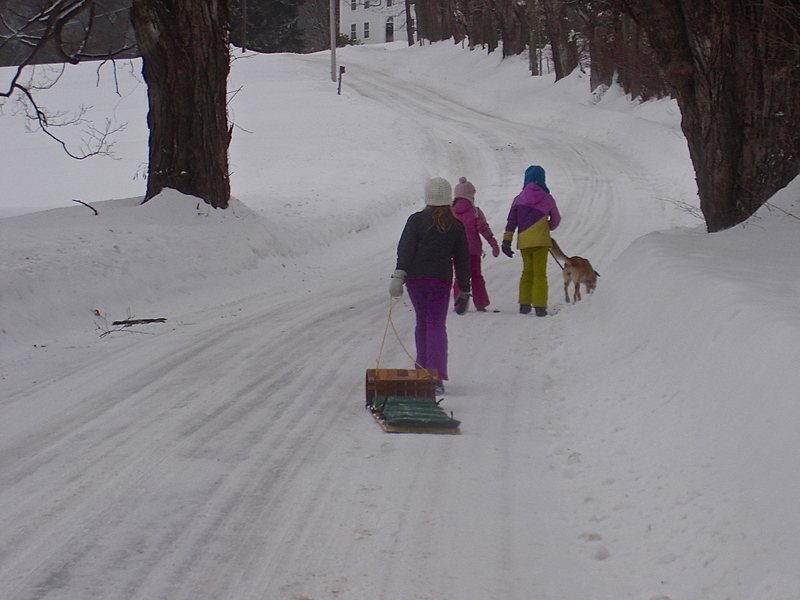 Sledding and the girls are such fun. It looks like so much fun, great photos and a great view. 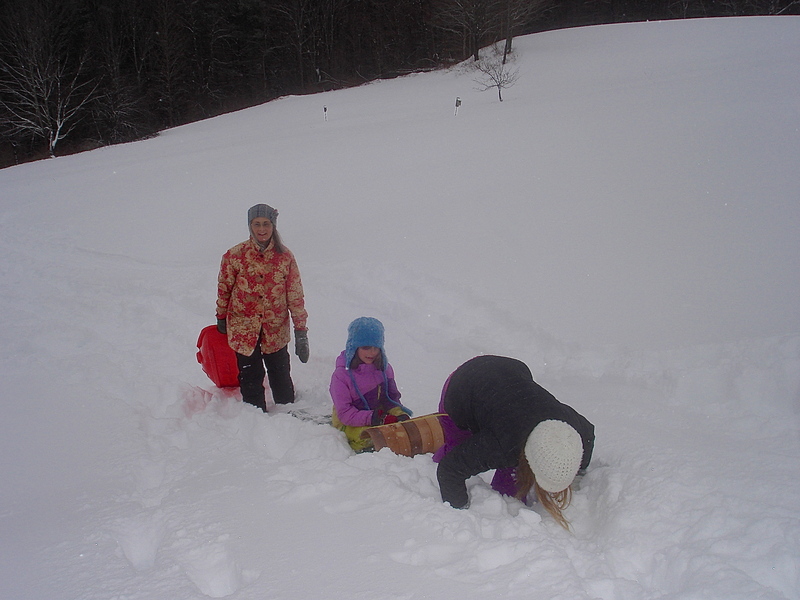 There will be many more chances to sled with this snow we are getting. Yes, snow sport enthusiasts are crowing! Please inform us whether is is July or August when all that snow melts, Eliza! Ha! I know, mucho nieve, si? It may be July before it all melts. In the hills the woods have had snow some years until Mem. Day. It might be this year as well. It has been snowing since Sat. & today it is really coming down – 8″ so far and more coming. I don’t ever recall a 3-day storm before. Crazy! Crazy is right! This must be impacting the economy and schools and, well, everything! The kids are going to have to attend school right through the end of June. I think they should ditch April vacation instead as they learn NOTHING in the end of the year. Business I’m sure is hurting, winter is slow anyway, but at least some commerce comes in, when its snows, nada. Thank you, Robin, we did have a blast! What fun and cute shots! It was – thanks, Fi. Nice to hear from you Michael – where’ve you been?